Are you a farmer curious about the impacts that grazing may have on your cropland? Or a cattlemen trying to talk to your farmer neighbor? This handout can help! It summarizes the information gathered from multiple studies evaluating the impacts of cattle grazing corn residue on crop yields and the soil, including compaction, nutrient removal and microbial biomass. 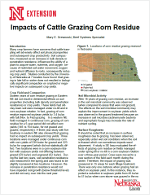 Download Impacts for Grazing Corn Residue. Have you made a connection through the exchange but now need to make a rental agreement? This handout outlines the items to cover in an agreement. Download Rental Agreements for Corn Residue Grazing.